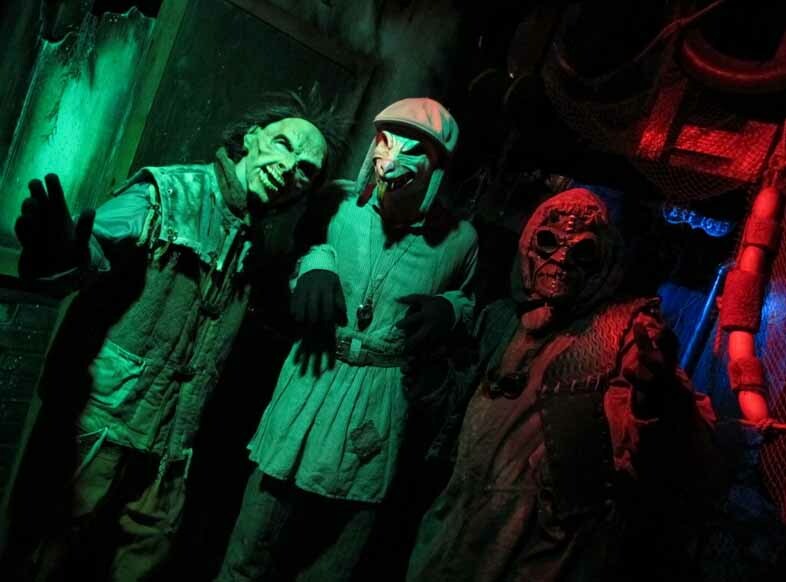 What were the best Halloween Haunts in 2013? Read on to find out...if you dare! Gather round, haunt-chasers. Halloween is over; ghosts have returned to graveyards; dust has settled back on tombstones, and the scream of the banshee is but a dwindling echo in the memory. Which means it is time to announce our annual Halloween Haunt Awards, honoring the best Halloween attractions in Los Angeles. This year, we will return to placing the haunts in categories - a process we abandoned in Halloween 2012, in order to provide more flexibility. The categories, however, are a bit fluid, because they depend on shifting trends. * The goal here is not to follow a rigid, formal approach but to find a way to bestow recognition everywhere it is deserved. The competition in this category always comes down to three or four major events; unfortunately, we did not get to the Six Flags Magic Mountain Fright Fest this October, so they are out of the competition this year. The Queen Mary Dark Harbor. The Queen Mary had some nice new mini-mazes, called Freak Shows, but only one new full-length walk-through. Halloween Horror Nights at Universal Studios Hollywood. This year's Halloween Horror Nights was loaded with fantastic sets, but there were few real scares. The Knotts Berry Farm Halloween Haunt overwhelmed us with its variety and creativity. The new mazes were imaginative, and the old mazes had been revamped and/or upgraded, making them worth a return visit. Heck, we even enjoyed Elvira's stage show, and we almost never sit down for stage shows when we could be walking through haunted houses! Insidious: Into the Further. This was our favorite maze at Universal Studios Hollywood this Halloween, thanks to its wonderful evocation of supernatural horror, which is perfectly suited to the season in a way that the more grotesque and gory attractions are not. This is a haunted house walk-through that feels like a haunted house. Trick or Treat. 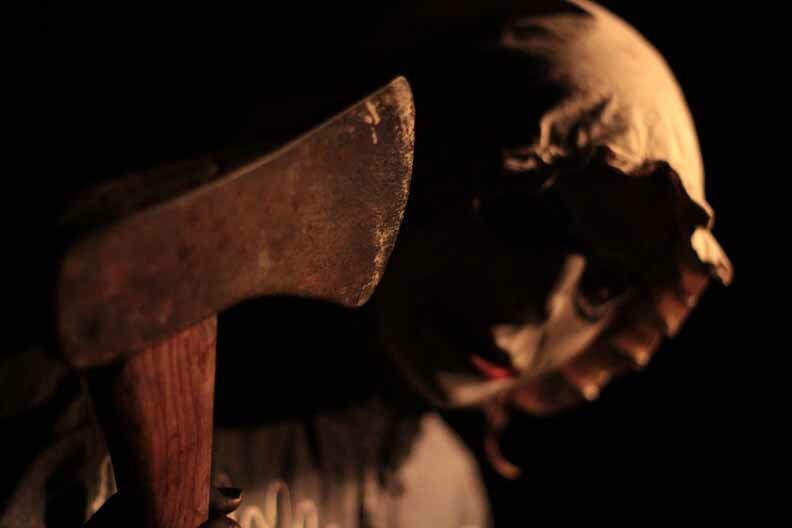 This is a holdover from last year's Knotts Scary Farm, but it deserves a place on this list thanks to its fairy tale approach to Halloween, providing a walk into a house haunted by a wicked green witch - seen flying on her broom at the conclusion! Black Magic. This new maze at Knotts Scary Farm blew us away with its period setting: the 1930s - a time of spiritualism, seances, and magic, culminating in a scene with a magician levitating overhead. There is simply so much packed into The Reign of Terror Haunted House in Thousand Oaks that this lengthy walk-through that it feels like multiple attractions all on its own: everything from a Victorian Mansion to a Bloody Bayou to an Insane Asylum to a Cursed Mine to a Quarantine area (the latter new for this year). 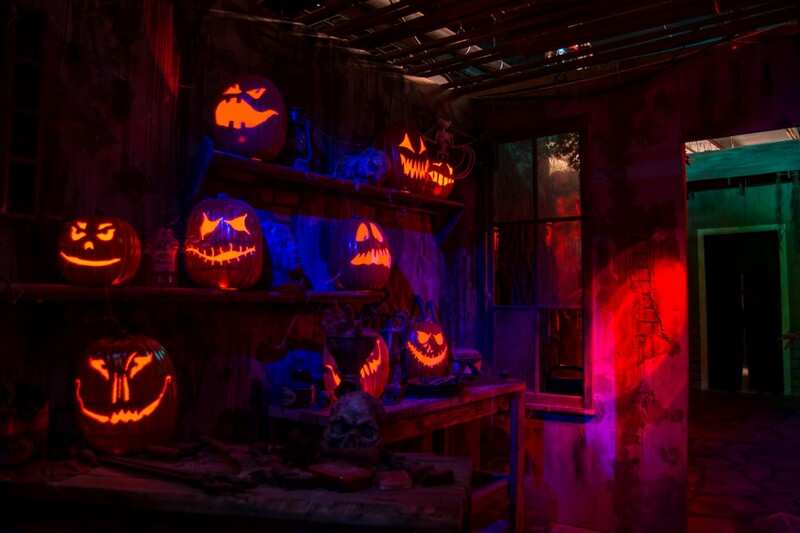 The sets and sound effects create a convincing atmosphere, and the combination of mechanical effects and live actors provide enough scares to satisfy any Halloween haunt fan. We are including Community Haunts in this category, not just Halloween Yard Haunts - basically, non-profit events, whether at a recreation center or someone's home. Haunted Shack in Torrance. 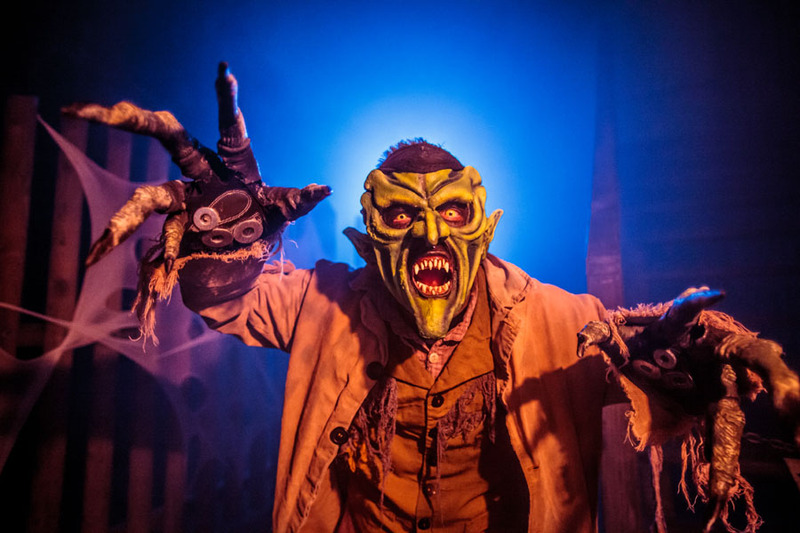 This innovative home haunt offered a tour of top ten terrors, ranging from darkness and isolation, which offered opportunities for some clever scares, including an impressive illusion of altitude to depict "Fear of Heights." Revenge of the Ninja at the Way of the Shadow Martial Arts Academy in Torrance. 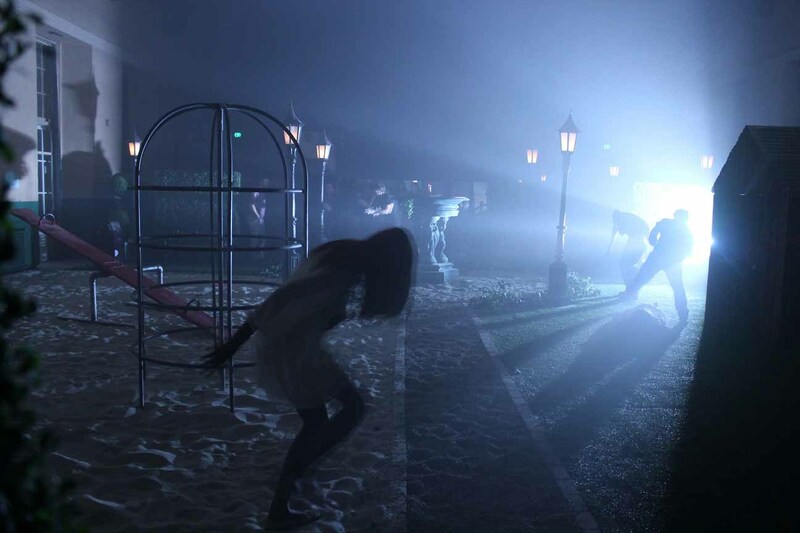 This uniquely themed community haunt benefits from the ninja-like skills of its performers, who seem able to appear and disappear at will in the darkness, launching attacks from unexpected angles. This stealth approach to haunting is augmented by some amazing special effects, such as the living torso impaled on a bamboo pole. Camp Sherwood in Northridge. Clever story-telling, sets, and atmosphere make this one of the scariest home haunts in Los Angeles. Incredibly, this one really did make you feel as if you were walking through a camp in the woods, where strange and diabolical dangers might be lurking behind the trees. Haunted Wilsley Manor 2 at Rotten Apple 907 in Burbank. Kudos go to Rotten Apple 907 for resurrecting their 2012 theme, Haunted Wilsley Manor, and making it even better for Halloween 2013. As always, we appreciate the old-school haunted house theme, which relates well to the Halloween tradition. Easily as intense as any professional haunted attraction, the Backwoods Maze continues to amaze us with the density of sets, props, and actors it packs into a back yard - and somehow, they found room to add new stuff for this year's theme, "Death Rage Rumble," such as the crazy clown ice cream truck. We're probably going to have to retire them from competing in this category, in order to give someone else a chance to win. Not too much competition in this category. Basically, you have the Terror Tram at Universal Studios and a few others. Nevertheless, we retained the category because there was a clear winner that deserved recognition. Shady Hollow Hayride in Corona. 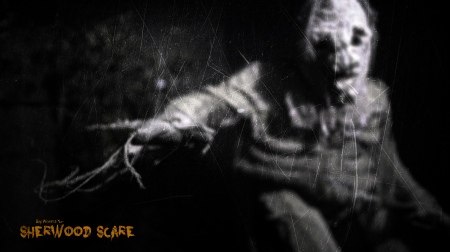 The desolate location surrounding this hayride certainly adds authentic atmosphere, and the cast are aggressively creepy. Not as spectacular as L.A. Haunted Hayride, but it works in its own way. Los Angeles Haunted Hayride. Lengthy and elaborate, with great sets and imaginative scenes, the L.A. Haunted Hayride is always a favorite. This year's embellishments were good but not quite enough to push the haunt into the winner's circle. This twenty-minute tour aboard the Los Angeles Live Steamers Ghost Train in Griffith Park takes you past a dizzying variety of displays, featuring crazed clowns, aliens, a flying saucer, giant spiders, Day of the Dead, and a Stonehenge-like display, evoking Celtic imagery from the origins of the Halloween tradition. The mechanical props and projection effects (no live actors) create the equivalent of a Disneyland ride aboard the miniature train, filled with Halloween treats that are spooky but not too intense for youngsters. Lots of stiff competition made this category to decide. Ultimately we opted in favor of a relative newcomer. The House of Restless Spirits in Santa Monica. This yard haunt remains an ethereal delight, subtly improving its presentation from year to year. Halloween 2013 saw the introduction of a few new effects that made this one mandatory viewing. House at Haunted Hill in Woodland Hills. Like the House of Restless Spirits, this yard haunt display has been so good for so long that it's hard to assess the improvements from year to year. Nevertheless, 2013 saw the addition of some nice touches. The projection effects on the house's facade were particularly spectacular. The Haunt with No Name Yet in Tarzana. 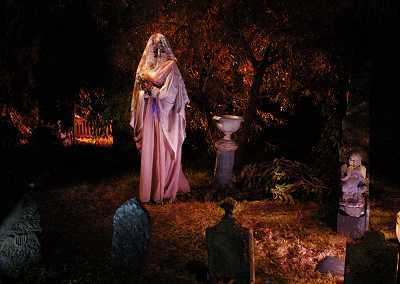 Low-key but evocative, this yard haunt features no overt scares, just a display that makes you feel as if you are entering the borderland between this world and the next - a "nameless place" (in the words of a ghostly mannequin) where the veil separating the living from the dead has been rent asunder. Boney Island in Sherman Oaks. Always fun and whimsical, Boney Island added several new sight gags this year. The magical, musical cauldrons are spectacular as ever. Hollywood Gothique did not see many old Western ghost towns this Halloween; in fact, we didn't see any except for this one, which looked completely convincing despite being built in a front yard. 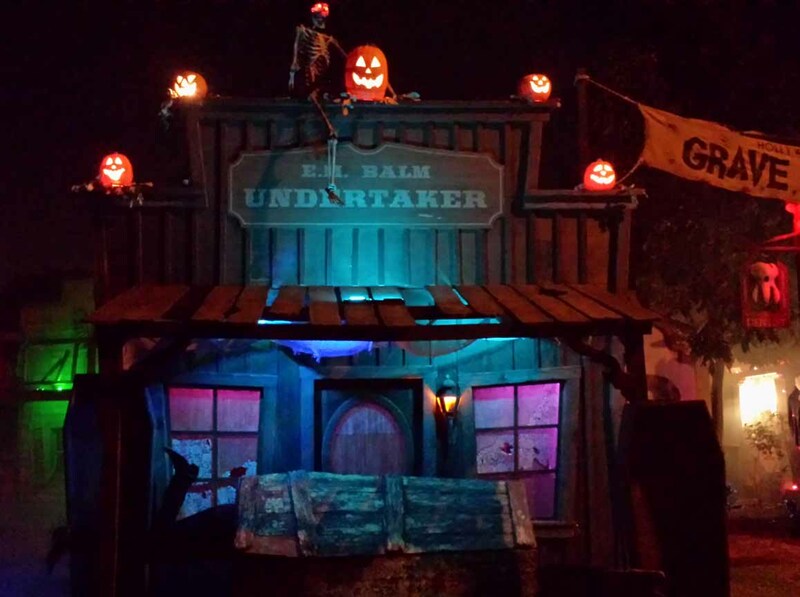 Grave Rock Gulch replaced Hollywood Haunter's 2012 Halloween theme, which was a mausoleum - and a little bit scarier. This year's sets were even more amazing, and as you walked through them, there were clever interactive elements, allowing you to pan for "gold" (actually body parts) or ignite an explosion inside a mine. Like Boney Island, Grave Rock Gulch was great fun for parents with young trick-or-treaters. Delusion: Masque of Mortality in Silver Lake. The third installment of Delusion was plagued by permit problems that led to a late start and an early conclusion; fortunately, there was little impact on the quality of the show itself, which deserved a longer run. We think there were some problems that rendered Delusion: Masque of Mortality inferior to its predecessors, but it was still better than the majority of the competition. The Purge: Fear the Night has nothing to do with Halloween and little to do with the movie The Purge; nevertheless, this attraction did an excellent job of sweeping you up into a terrifying situation and engaging you with the action from beginning to end. Universal Studios promises to make you feel as if you are inside a horror movie, but they come nowhere near this level of immersion, which makes you feel like a supporting player in a tense hostage situation, as guerilla fighters launch a plan to bring down the New Founders, the government responsible for instituting The Purge, an annual night of sanctioned lawlessness. Once the action started, we never had a chance to catch out breath until the conclusion. Thank goodness for the lounge, where we could relax and get a drink to help decompress! This category sounds deceptively simple, yet it presents difficulties. Do historical/cemetery tours with costumed characters performing dialogue (such as the Strathern Park Ghost Tour and The Voices of Pioneer Memorial Cemetery's Almas: A Day of the Dead Celebration) qualify as plays? We have decided to include them here rather than a separate category. Do we really want traditional dramas staged in non-traditional venues (e.g., Wicket Lit) competing head-to-head with non-traditional performances staged in traditional venues (e.g., Urban Death)? We have elected to disqualify the later, because it fits into another category. The Seance at the Heritage Square Museum. Heritage Square Museum's annual Halloween and Mourning Tours depict Victorian beliefs regarding Halloween, death, and the afterlife, including spiritualism, which was represented this year by a dramatic recreation of a seance. We sat through several, each one different, and the performers were perfect, sometimes interacting with each other, sometimes drawing in visitors, whose questions were answered by rappings on the wall or sometimes by a possessed assistant, who channeled the ghost of the dearly departed. Drama After Dark: An Evening of Poe and Gorey at the Huntington Gardens. Essentially, this is a series of monologues, with actors giving dramatic readings of short stories by the two titular authors. The wonderful settings, mostly outdoors and barely lit, provide the mood; the actors provide the drama. It's quite a compelling combination. The Afflicted at NoHo Arts Center. Theatre 68 offers a memorable rendition of Leif Gantvoort's play - alternately horrific and hysterical. The dead are coming back to life, but they're not zombies - at least, not as we know them from movies. Come early and get a front row seat, but be warned: you will need a poncho to escape the rain of blood! 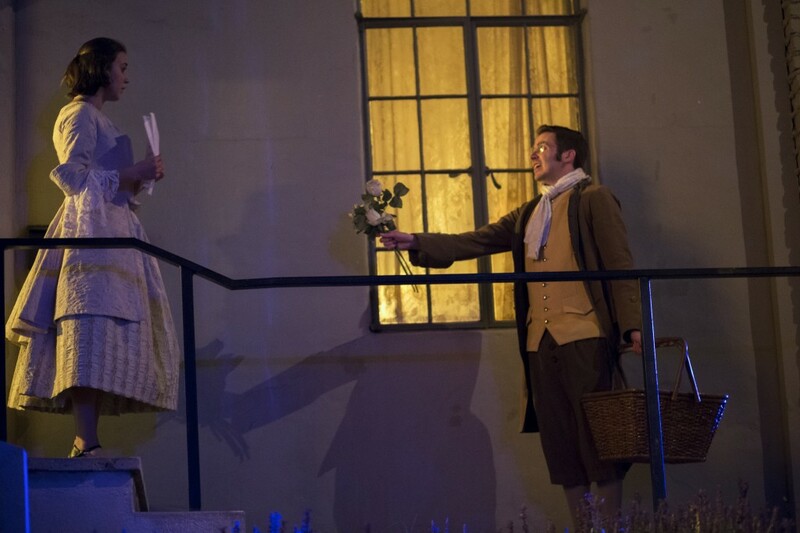 Katie Pelensky and Carlos Larkin in “The New Catacomb" at Wicked Lit 2013. Photo by Daniel Kitayama. Wicked Lit's annual anthology of three short plays based on classic horror literature has always been enjoyable, but this year, everything came together. 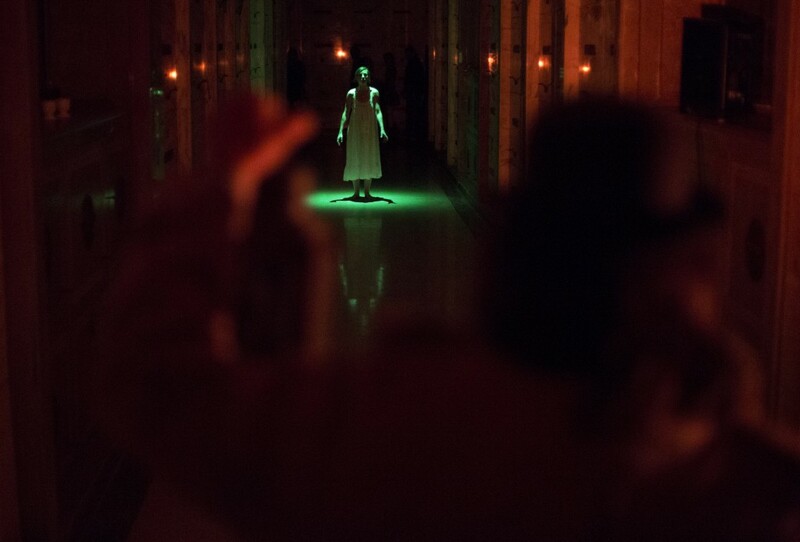 Not only were the dramas well staged and well served by the location (the Mountain View Mausoleum in Altadena); the interstitial "Red Death Experience" tied the separate stories together into a unified experience that was satisfying from beginning to end, setting the bar higher than ever before. Night of the Living Zoo at the Los Angeles Zoo. 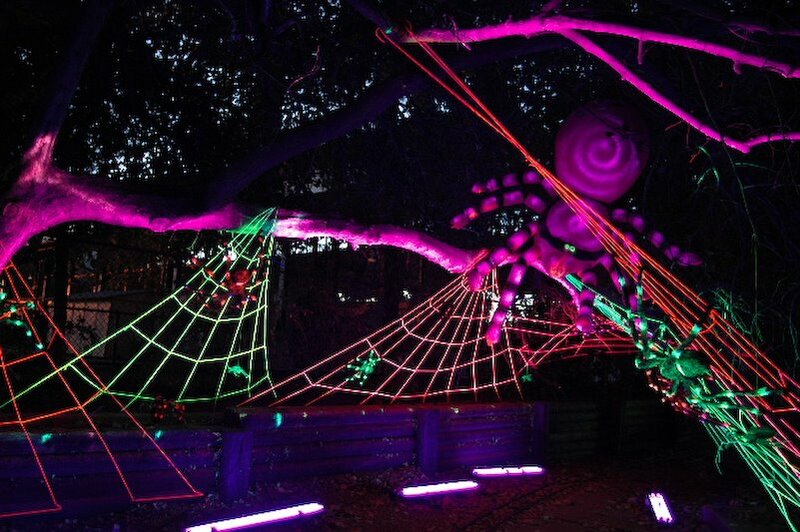 Essentially, this was the zoo with a Halloween overlay. Most of the mammals and birds were asleep, but the reptiles were still slithering, and there were presentations on vampire bats and other topics of interest, along with creepy freak show entertainment, live music, and a costume contest. Creatures lurked in the shadows, and dead attacked the living in the zombie cave. For a first year, this was a pleasant change-of-pace Halloween attraction. Hopefully, it will return and build on this foundation in future years. An absolutely unique theatrical experience, sans dialogue or traditional narrative, the Urban Death: Tour of Terror at Zombie Joe's Underground Theatre in North Hollywood inflicted an uncanny sensation of terror unlike any other Halloween event in Los Angeles. Beginning with a short walk-through (lit only by a tiny penlight), Urban Death's main event was a fifteen-minute series of blackout vignettes in the stage area, each one creepier than the last, culminating in an extended stretch of darkness filled only with rustling, scratching, and ghostly voices whispering your name - yes, your name, as if they had read your mind! The entrails and headshots in Theatre 68's The Afflicted were startling and convincing - and all the more impressive because they occurred in a small, well-lit venue, which allowed for close scrutiny by the audience. The Evil Dead: Book of the Dead at Universal Studios Hollywood was a lot of fun, but despite the constant pop-scares, we were never much frightened by anything in this maze. However, the final scene - a gore-filled extravaganza copied after the 2013 remake of The Evil Dead - was so over-the-top outrageous that we had to stop and watch it twice. We have already mentioned the levitating magician and the flying witch at Knotts Scary Farm. What could top those? 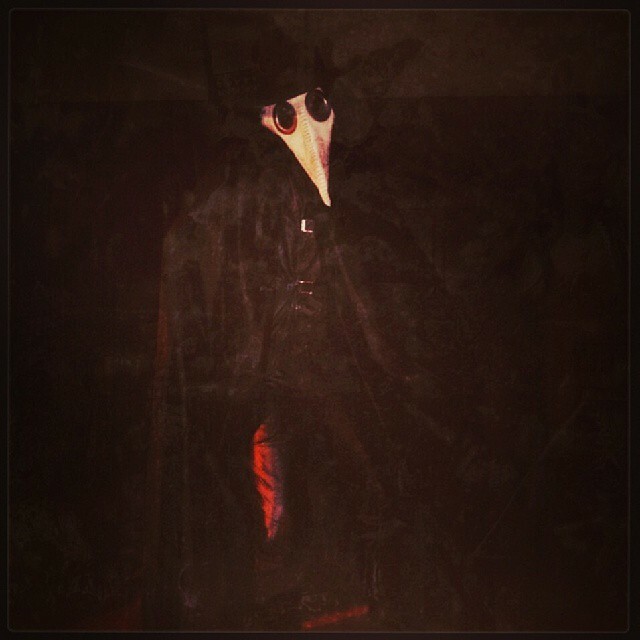 It's an effect you would think could be accomplished only on film, yet Delusion: Masque of Mortality pulls it off right before your eyes: a tall menacing "Plague Doctor" is shot, but the body that falls to the ground is that of a short, harmless girl. This show was expensive, but that one moment was worth the price of admission. There were several this year worth noting. Ghost Cat from House of Restless Spirits. The old black cat, seen in previous years as a trembling, growling prop, is gone, apparently to the big cat box in the sky. He now manifests as a ghost upon the roof - a transparent feline who turns at the sound of his name, both spooky and endearing. The Sundial from House of Restless Spirits. This is far from the most spectacular effect we saw this Halloween, but think about it: a sundial at night! The stylus, shaped like the sail of a boat, casts a shadow that spins impossibly fast, suggesting the fleeting nature of time, while a disembodied voices warns that "Time and Tide waits for no one!" The Anti-Gravity Water from Boney Island. This illusion is so convincing that proprietor Rick Polizzi, or one of his minions, was required to stand next to it, waving a hand through the stream to prove that it was no mere projection, the "dipping" a cup (upside down) to catch some of the drops running up from a barrel to a vial held above. Amazing. 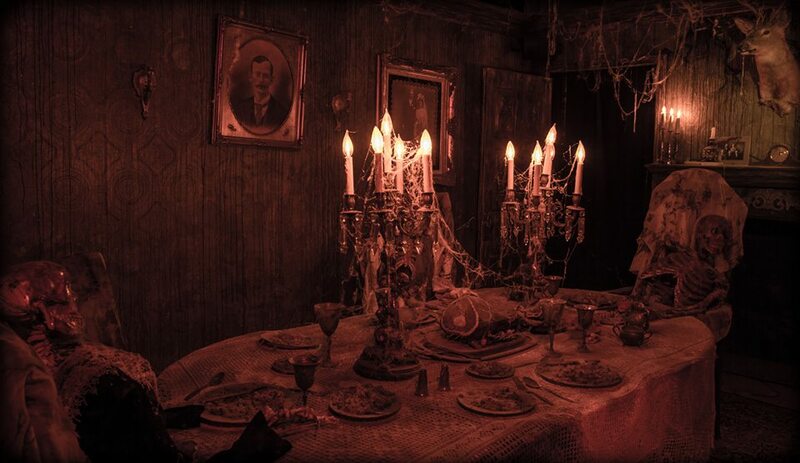 The higlight of last Halloween's Haunted Wilsley Manor was the upside-down room, with a table clinging to the "floor" - which was actually overhead. For Halloween 2013, Rotten Apple 907 improved on the scene by adding a "dead" butler, who suddenly comes to life - but he's walking upside down, on his hands! This effect was not only amazing but startling. Why does this one top our list? First, its a great full-body makeup-costume, with spindly legs and overall proportions hiding the human figure within. More important, the setup works so perfectly: you see the creature on video in the beginning of the maze and assume you will only see it on video because something like that could not be realized in three dimensions in an amateur yard haunt. How wrong you are! It lurches out of the darkness at you just before you escape from Camp Sherwood, its hiding place so perfect that you have no sense of its presence until it emerges. It's a perfect effect, perfectly staged. Every two or three years, it seems, a new trend or technique emerges. Sometimes, it's a new technological development (makeup that shows only under a black light); sometimes, it's simply a new concept or strategy (camoflage the actor by putting him in a costume painted to match the background). We have noticed three trends developing over the course of the past two Halloweens. Up-Charge Attractions. Halloween Theme Park Attractions now offer extra special goodies for an additional charge, such as the Trapped Maze at Knotts Scary Farm of the Freak Shows at the Queen Mary's Dark Harbor. By allowing in fewer customers, these attractions avoid the conga-line approach of most theme park walk-throughs and provide more personal scares, making them worth the money if you can afford it. Darkness. This is a cheap but effective way to generate scares. The In-Between Maze at Los Angeles Haunted Hayride has been using it for a while. The Queen Mary used to use it in the Cage maze inside the Dome; now it shows up in their Freak Show mini-mazes (though in some cases it is not so much darkness, as low-visibility due to thick fog). The Lords of Salem maze at Rob Zombie's Great American Nightmare actually required you to wear a hood and feel your way through. This approach saves money on sets, and we wouldn't want to see an entire haunt built around it, but it does work as a change of pace from the usual jump-scares. It's a zombie shooting gallery at Haunted Hollywood Sports! Why don't those monsters attack you in all those Halloween Haunted Houses and Hayrides? Why do the zombies on the back lot of Universal Studios stumble around and harass you but ultimately leave you alone? We have no idea, but a couple of Halloween attractions are offerng an answer: you're protected from your undead attackers because you're shooting them! Haunted Hollywood Sports in Bellflower offers three Kill Houses, in which you fire pellets from airsoft guns to take out the living dead before they can take out your liver. Fears Gate in Oxnard features a paintball attraction in which you add a few more rainbow colors to the crazed clowns lurking within. Being able to fight back against your attackers totally changes the dynamic; no traditional walk-through will ever feel quite the same again. Old Town Haunt in Pasadena closed the doors on its underground catacombs for the last time this Halloween, thanks to permit problems with city inspectors. Since its inception nine years ago, the Old Town Haunt Halloween Attraction had offered some of the best sets and atmosphere of any Halloween attraction in Los Angeles; the subterranean setting was different from anything at any competitor, and there were loads of surprises: crawlspaces, trick passages that kept you walking in circles, and mirrors that disguised the actual location of the ghosts preparing to pounce on you. 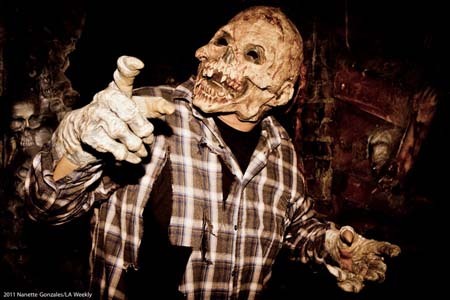 Our initial impression, back in 2005, was that two few ghouls were inhabiting the dank passageways, but since then the monsters multiplied, overrunning the cavern and creating one of the most consistently satisfying walk-through haunts it has ever been our pleasure to encounter. That the screams will now go silent is a sad event for haunt-chasers, more terrible and disturbing than any monster lurking in darkness. Fortunately, the memories will last a lifetime and - who knows? - perhaps beyond the grave as well. Ilona Kulinska and Eric DeLoretta in "The Legend of Sleepy Hollow." Photo by Daniel Kitayama. In case we didn't make it clear above, the Wicked Lit Halloween Theatre Festival has always been good, but this year its elements coalesced in a way they had never done before, yielding a perfectly satisfying experience from start to finish. We went on press night back in September. Six weeks later - after visiting dozens of other Halloween attractions - Wicked Lit still stands out in memory as the Best Halloween Attraction of 2013. We cannot imagine how they can top themselves next year, but we cannot wait to see them try. *For example, since the demise of Fright Gallery in Burbank, there are no "Amateur Halloween Yard Haunt Musicals" in Los Angeles.